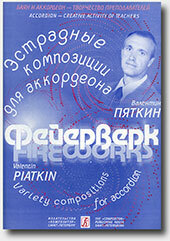 Valentin Piatkin (pseudonym - Poliuv'e) is teacher, improvisator and composer. He is the author of a unique technique, which allows on the basis of inherent natural given to develop the latent individual abilities and to finish the student up to a level of the Master and promotes through lessons of improvisation in perfection to take possession of the instrument for short time, freely to improvise and to compose music, both amateurs, and professionals. Valentin Piatkin was born in 1954. In the age of four years the hobby for music began. During study at musical school, musical college and Krasnodar Institute of culture and arts seriously was fond of improvisation and composition. He composes various music: choral, dancing, variety, instrumental, in classical style. With occurrence of synthesizers has taken a great interest also in computer music. On a confession of the composer, music was for him a Secret, which to him always was to be comprehended. All his saved experience carefully passes to the students.